In the walker-infested, post-apocalyptic world of The Walking Dead, survivors can appear nearly as frightening as the undead monsters they endlessly encounter. The main reason for this is that whether survivor or walker, they almost always end up killing, and that can tend to be a bit messy. ​Here you will find a guide to help you scar and mess your outfit to look like a survivor, which depending on how you look at it, could also easily be applied to a walker costume as well. Often times on The Walking Dead you will see characters using Gerber professional cutting tools as melee weapons. This is because the gang finds a set in an abandoned vehicle during season 2 (it is worth noting that in order to be Con friendly you would have to construct your own foam duplicate using the original as a pattern). ​Anyhow this specific set matching the one used on The Walking Dead is available to purchase should you feel so inclined, it's the Gerber Zombie Apocalypse Survival Kit. Surviving in the Georgia heat with no power or running water would no doubt get a little messy. So you’re going to need to dirty your face a bit. ​In order to recreate this look accurately you could just go rub some mud from the front lawn on your face… but you never really know what kind of micro-organisms could be in there. ​I have also seen people use charcoal or eyeliner and those work fine, but my preferred method is dirty make-up. It’s safe for your skin and you don’t run the risk of smearing dog-doo on your face. ​This zombie dirt make-up is the best I’ve come across so far! One quick and easy way to age and scar your ensemble of choice is to burn it a little, or alot depending on what level of crispy that you’re going for. ​Personally I prefer the long barbecue grill type lighter to keep myself a safe distance from the flames and heat. If you need to pick one up, these lighters on Amazon are reliable and inexpensive (if you’re going to try this at home please do so at your own risk and for Heaven’s sake, use caution people). ​It isn’t too difficult (assuming you’re careful) and a little can go a long way to really bring your costume to life...or undeath? ​This idea comes straight from the prop-master of The Walking Dead. A great way to add unidentifiable stains and general blood splatter to your costume is to mix water and brown or red fabric dye in a spray bottle and VIOLA! Realistic blood splatter and realistic mud stains (I would suggest using separate bottles so as not to alter the dye’s shade). HINT: practice first on some scrap fabric to get it just right. ​In case you don’t already have one or two lying around the garage, this basic spray bottle would serve our purposes. This brown fabric dye is perfect for making mud, vomit or dookie stains on nearly any light colored fabric. Though It’s not the purpose it was necessarily intended for, this Rit red fabric dye creates a realistic ”fresh” blood stain on any lighter colored fabric. When it comes to distressing there are really two generally accepted methods. Sanding and dremeling. Sanding is good for covering a large area or creating whiskers and chevrons. Dremeling is great for small areas and fraying edges or for creating designs or patterns. ​This Wen variable speed dremel is the one I personally use for little projects like this. Should you be in need of one, this 3M sanding block should serve your distressing purposes. And if you're in need of some refills for the sanding block, I recommend these 3M refills. 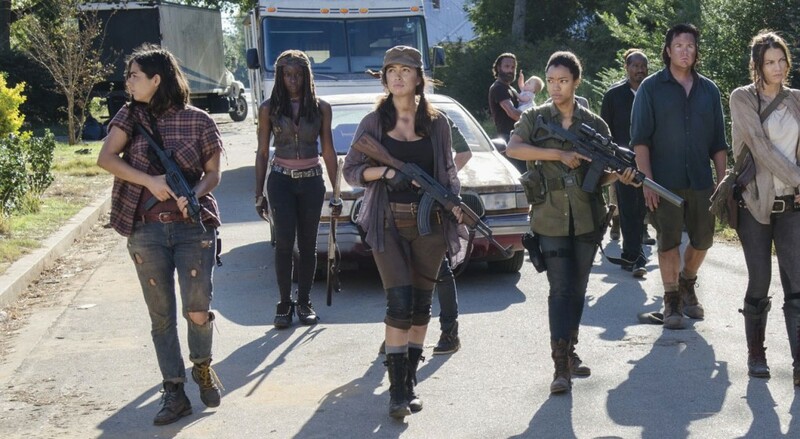 Finally our last tip to distress and age your Walking Dead cosplay is to chop it up a little. ​Once again this is something that should be done carefully and under adult supervision if necessary. Using scissors, a utility knife or maybe even your replica of Michonne’s katana, just cut, slice and chop your outfit until it looks lived in. You can make battle scars or just random tears and slashes. You could even make a cut or hole and then go over it with the dremel for added effect. ​Here’s a Stanley utility knife if you need a new one. It’s the classic retractable style for safety. As for scissors, if you’re anything like me you probably have at least a few different pairs in strategic locations around your living area, but if you need a new sharp set these Scotch brand scissors are a safe bet. Hey! i got some Leather cowboy boots (Almost the same as rick has) and well, they look brand new. How would i weather it so it would look more like this: http://imgur.com/a/hb7co Thanks in advance!